Picture it: you find yourself as a librarian in ancient times, and your library has erupted in flames. You realize that centuries worth of learning and knowledge are contained inside, and it could all be lost forever if you don’t take action. So what do you do? Do you work together with your fellow librarians to get as much water as you can and try to put the fire out? Do you all create some sort of human conveyor belt that allows you to save as many books as you can? Or maybe you work together to come up with a plan, determine where the most valuable books are, and run in to save as many as possible? Nah, I think it’s better to just go it alone. Heck, let’s make it a competition. Person with the most books wins. Bonus points if you go in where it’s more dangerous. That’s where we find ourselves in Fire in the Library, the latest game from Weird Giraffe Games designed by Tony Miller and John Prather. And while there are probably better ways to get books out of a burning library, there probably aren’t any that are as much fun. Besides, Parks & Rec already taught me that librarians are the worst, so it should be expected. So forget about the consequences of your poor planning and find out more about this great game that I could see becoming a staple of board game collections everywhere. 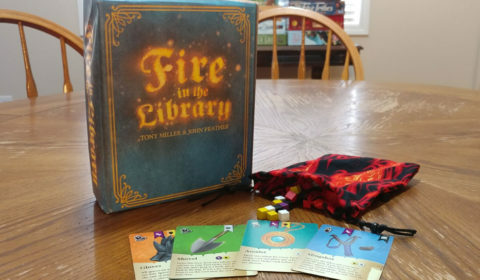 Fire in the Library is a press your luck game that has you and up to five other players working to get as many Knowledge points as possible by saving books and avoiding fire. Along the way, if you happen to save the books in more risky situations, you also get bonus Bravery points. All of this continues until one section of the library is completely destroyed, at which point the game ends and whoever has the most points wins! So how does one simulate saving books from a burning building? I mean, setting fire to your gaming table isn’t a great idea, and if you start going around burning books your fellow players may start having flashbacks to high school English class (thanks a lot, Ray Bradbury), and nobody wants that. This game wisely takes a safer route and represents the books and fire with small little cubes that are kept inside of a cloth bag.The main mechanic of the game has players blindly drawing the cubes from the bag, hoping to pull out books that score them points and not fire, which could cause them to end their turn and not score any points. Along the way, players will make choices that impact the riskiness of their journey into the flames, allowing them to score more points but also making it more likely that they will lose everything to the fire. They will also get to use tools that will assist them in gaining books and getting rid of fire, but may also cause other players to have a more difficult time on their turn (I’m telling you, librarians are the absolute worst). 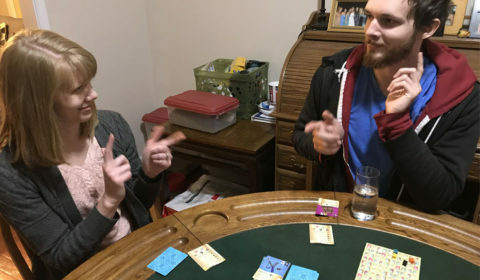 The game is played in rounds, which begin with players selecting turn order cards in reverse score order. These cards not only tell you in which order you’ll be entering the burning library (drawing from the bag), but also how risky it will be when you do so. The earlier you are in turn order, the more likely it is that fire will end your turn before you can score points.Generally speaking, you draw up to five cubes on a turn, represented by five spaces on your turn order card. If you draw two fire cubes, your turn is done, you score no points, and the fire spreads. If you stop before this happens, you get to score the points for the books you saved. Some of the spaces on your card may make things a little more precarious in that just one token can end your turn. While obviously more dicey, it can also be more rewarding – scoring books on these spaces gain you bonus Bravery points. As the game continues, you may find yourself taking more and more chances so that you can make bigger jumps on the point tracker. One mechanic that I truly love is found in the library cards, which are divided into four different stacks for the four different types of books in the game. As the game progresses, the library continues to burn. 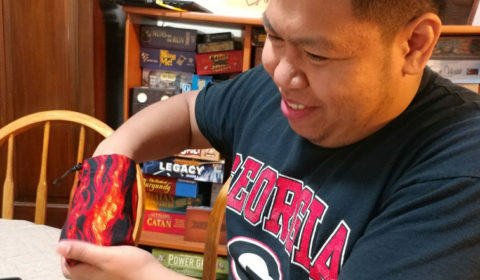 When a player fails to save books, the fire spreads , causing books to become worth more points, but also adding more red fire cubes to the bag, increasing the odds of failure on future turns. If ever the fire consumes the entire stack of cards for one type of book, the game immediately ends. The rules for the library burning are very well balanced, and books end up becoming more and less valuable than others as the game progresses. The tool cards work to change the way different aspects of the game are played. Some cards impact how you draw cubes from the bag, allowing you to get rid of fire cubes or even pass them over to another player. Other cards change how you score, allowing you to hang on to some of your book cubes until the end of the game. The variety in the tools is great and they all are useful, and thus they serve as a good ‘consolation prize’ for players whose turns end in spreading fire and not gaining any points. The tools also cause players to second guess whether they want to keep going as they draw cubes from the bag, since stopping your turn while in the ‘safe’ spaces on your turn order card also rewards you with a tool. Another highlight is that the tools provide most of the player interaction. A few tools – like the Library Cart and the Slingshot – allow you to make turns more difficult for the other players. The results are never crippling, but they do set the table for some playful rivalries to arise as the game progresses. I played this game with two players and with five players, and I had some great experiences. With just two people, the game flew by. I must have had some sort of magnet in my hand that attracts red wooden cubes, as I was drawing fire so often that I never really scored any points. My opponent, meanwhile, was having the time of his life and ended up scoring a ton of points. The whole experience lasted about 13 minutes. With five people, we all should’ve headed over to Vegas, because it was like the fire cubes weren’t even in the bag. The game, suggested to take thirty minutes, lasted almost an hour and a half, not because of anything the game did, but because we were all drawing so well that the library wasn’t really burning as quickly and we were just racking up points. I can imagine that each time we break this game out, you won’t really know what to expect because of that little bag. In both cases, though, we had a blast. It’s amazing how quickly we started talking smack about the other players. We would cheer for fire as the player reached into the bag to continue their book-saving quest. We would laugh as a player sat for almost a minute with their hand in the bag, mixing around the cubes, trying to do the math and see whether or not they should take a chance or play it safe. We would lose our minds when we would play a Bucket tool card to remove a fire cube so we could keep our turn going, only to immediately draw another fire cube and bring it all to an end. But win or lose, everybody said they had a great time and that they looked forward to playing it again. As I look at Fire in the Library, I see it as a game that should be in mass production and should find its way onto the shelves of board gamers worldwide. I just think that it’s such a solid, complete package that anyone young and old can quickly jump in and play. While the rules took a bit of time to explain, at their heart they are very simple, and once people have mastered the cards, they are good to go. All of the mechanics – the drawing from the bag, the tools, the library cards – complement each other so well and work in harmony no matter what stage of the game you are in. The artwork is also great – everything is so intricate and detailed that even in a playtest, it looks like it could come from any of the most high dollar games out there. I honestly think Fire in the Library is a better press your luck game than Incan Gold, one of my personal favorites, because it allows for more player interaction and decision making, keeping everyone more engaged from turn to turn. If you’ve never backed a game on Kickstarter, this would be a great place to start. It is easily the best game I have ever previewed, and it’s one that I would recommend to anyone. So forget about camaraderie and working for the greater good, and go fight your friends over burning books. You’re only librarians, after all. Weird Giraffe Games provided us with a prototype copy of Fire in the Library before their Kickstarter campaign. This in no way influenced our opinion of the game. Previews are a glimpse into an upcoming game with the pros and cons that we experienced prior to production of the game.